To access Business Chat, T-Mobile users can conduct a Siri search or look up T-Mobile in the Maps app. There will be a message bubble icon that can be tapped to start chatting with a live representative at T-Mobile. T-Mobile isn't the first company to back Business Chat. Zendesk, Discover, Lowe's, Wells Fargo, Hilton have all announced support. Depending on which company you are talking to, there are a variety of use cases for Business Chat. If you chat with the Apple store or Lowe's, for example, you can get help placing an online order, and check out directly from Messages using Apple Pay. In T-Mobile's case, Business Chat is an easy way for anyone to alter their plan, update their address, pay their bill, or ask general questions. The new feature is supported for both personal and business customers as well as those who are not currently T-Mobile customers. Business Chat, which launched just a few weeks ago with the release of iOS 11.3 and macOS 10.13.4, is currently limited to the United States. Like traditional Messages, it works cross-platform, meaning conversations can be initiated on your iPhone, then moved to an iPad or Mac. Previously, companies like T-Mobile would build chat options into their apps or website. These features typically resulted in poor experiences, as browsers might reload or users would lose their place in the app while trying to get help. Now, all messages will be relegated to the same location; the Messages app. The biggest designator that you are chatting with a brand is that the contact name will have a verified checkmark next to them, and there will be a clear theme in the actual conversation. As an example, you can see the T-Mobile Business Chat has been branded pink. Since it uses the messages app everyone is familiar with, it taps into other standard features like read receipts, delivery notifications, attachment browser, and even iMessage extensions. 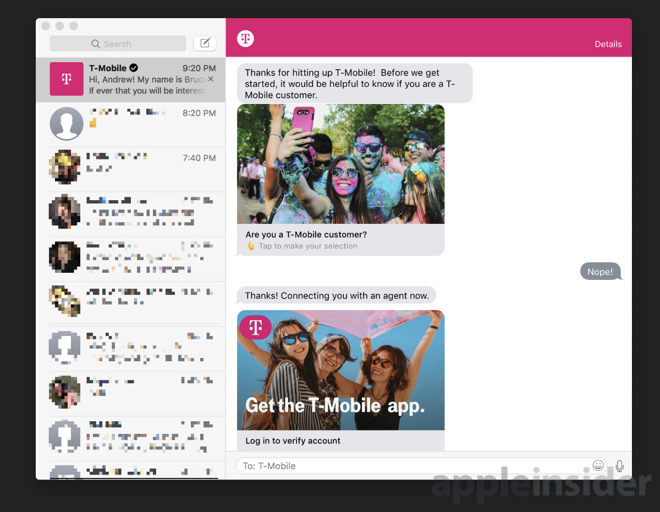 When we reached out to T-Mobile through Messages, it prompted us to login to their T-Mobile account with the T-Mobile iMessage app extension. In use, this feels like a very seamless way for customers to reach out to companies but may take some time to educate customers on the method. It may not be entirely intuitive out of the gate for users to realize they can message businesses just like their friends and family.